"An ambitious first offering with excellent potential for a new fantasy action series!" The Columbia Review. For readers who enjoyed “The Chronicles of Narnia,” “Game of Thrones,” and J.R.R. 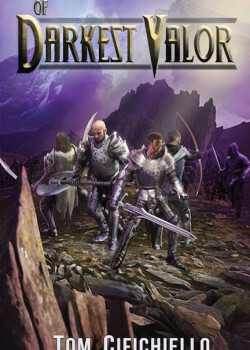 Tolkien’s “The Hobbit” and “The Lord of the Rings,”, or new readers who seek to be transported into the midst of wildly inspired fantasy action, “Of Darkest Valor” by Thomas Cifichiello is a wonderful new offering. Taking placed in the imaginary kingdom of Varkuvia, (which is ruled by no less than five kings), the plot revolves around the secret Order of Acrium, its demise as well as its competing forces and powers. Driven by strong themes of political power, hereditary honor, lustful passion, and the allconsuming competitive ambition to rule over others and gain wealth, it is ultimately a conflict of right versus wrong. The descriptions of battle scenes are especially realistic and dramatic. The author presents a convincing balance between clever strategy and human folly. The presentation of the main characters is three-dimensional and provides the reader with a good window into their thoughts and feelings, enabling us to identify with the characters and understand their deepest passions and furious motives. “Of Darkest Valor” is a broad canvas type of novel, which is to say that, while it would be enjoyable for young adults, male or female, it would likely reach a broader audience. Like the successful fantasy action series that feature on the bestseller lists these days, this novel will be enjoyable for all ages of readers who seek highly imaginative action fantasies. The novel offers an intricate storyline and colorful, fleshed-out cast of characters. The author manages to use the action and adventure storytelling vehicles to explore the moral territory of right and wrong farther and deeper than most works in this genre. An example of this is a scene showing a major character who suddenly realizes how wrong he was about his own role: “That was when it hit Orrin. He was no longer the shining hero sent to save them. He was the invading monster, setting their homes on fire and killing their neighbors and relatives.” With this type of uncommon depth, this novel could help readers reflect about our own world, and about the roles contemporary powerful forces play in politics and in war, whether as saviors or monsters. In summary, “Of Darkest Valor” is an excellent and ambitious first offering from author Thomas Cifichiello. It demonstrates an excellent potential for a fantasy action series that could compete with the best offerings currently available. Highly recommended.